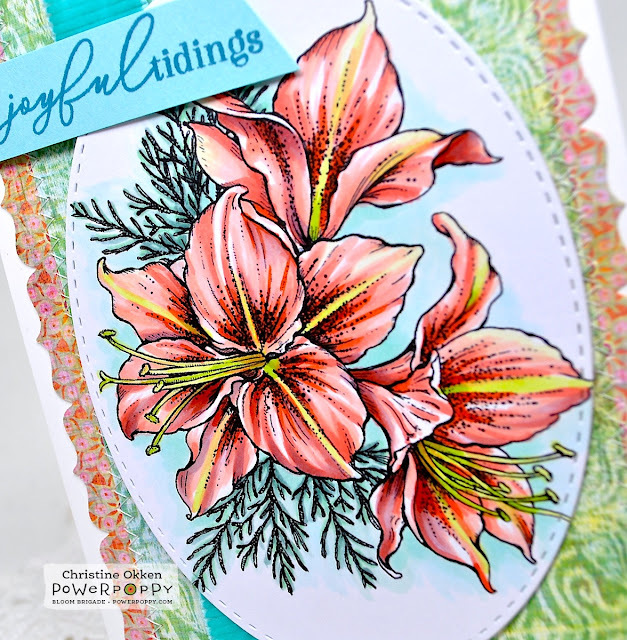 It’s been an awesome week of the Happiest Holiday Stamp Release at Power Poppy! Today we bring you the showstopper - Amaryllis Bliss! I was so excited to use these luscious blooms, that I made two designs to show you today. I love that this is another botanical set where you can customize a whole bouquet with all the pretty elements, so for this design, I used the bits of cedar mixed in with the amaryllis blossoms and went with a more citrus and seaglass palette. I found fun patterned papers in my stash to pair with the colouring and then stitched it all together with pretty borders and rich velvet ribbon. I made it very mailable without extra embellishments. 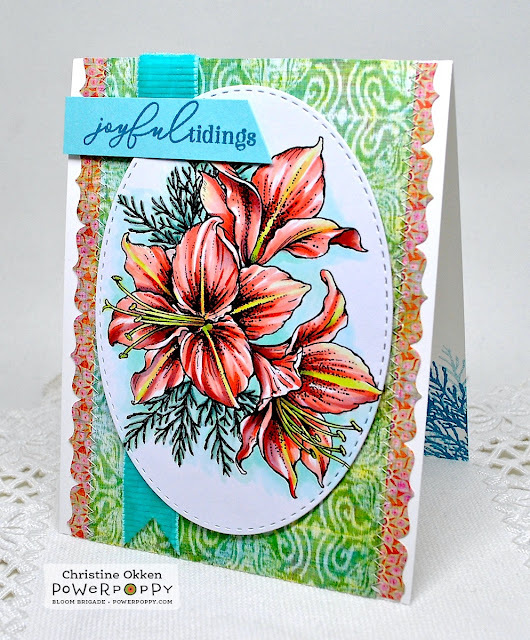 Marcy is releasing Coordinating DIES with this set too, so I can’t wait to dive into them as well! It will make bouquet arranging a snap. Aren’t those petals beautiful? They are awesome to colour. I used softer shades of R20, R21, R22, R24 for the corals with BV00 in the shadows, and YG00, YG21, YG23 for the chartreuse shades. Amaryllis can be quite veiny so I used lots of long strokes to simulate those veins in the petals. I used BG00 and BG11 on the background and some BG93, BG95 for the cedar. Now we have a card with lots more drama. The traditional bright red of amaryllis is so striking, especially in the dead of a white cold winter, so I had to try some red ones too! 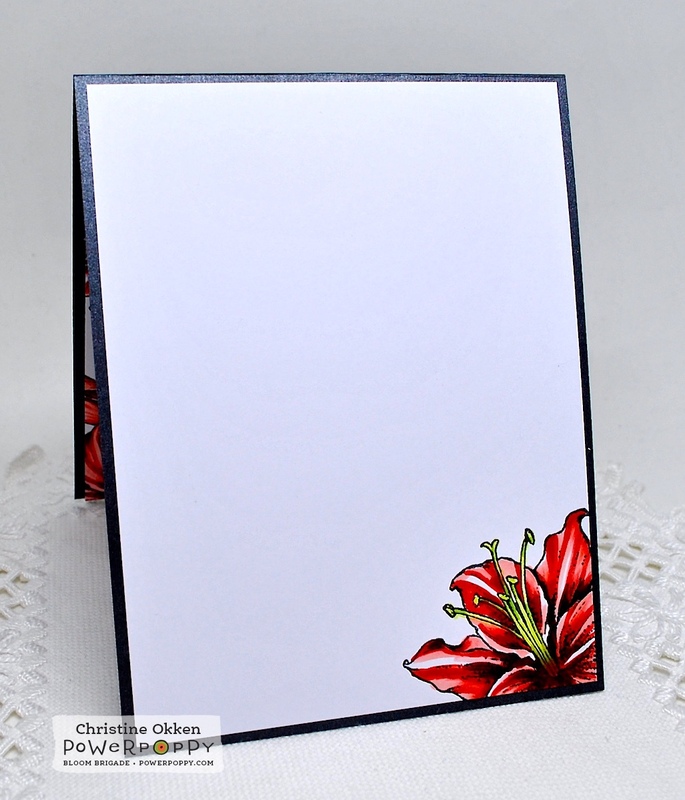 For this one, I stamped the trio of blooms throughout the card front. After colouring with Copics (R20, R24, R27, R29, R59), I cut out the border edge with a Spellbinders die, and then embossed the gorgeous scripted sentiment. Some gold metallic ribbon and sequins complete it! 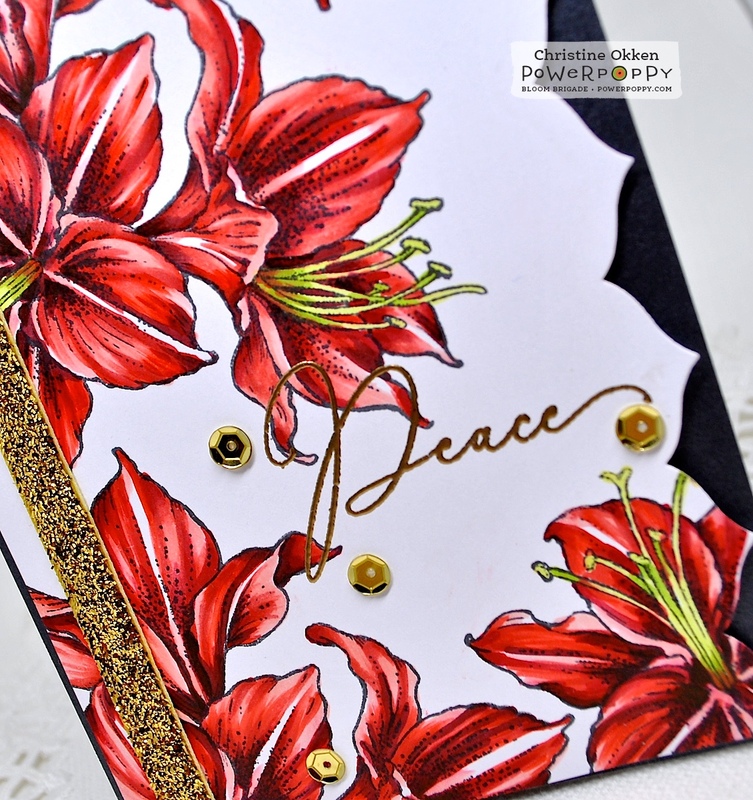 A really CAS design where the boldness of the flowers take center stage. Inside the design I added another bloom as accent. Love the drama of the black metallic paper against the white and red. So there you have all the beauty of the Happiest Holidays 2018 Collection. It’s been delightful to share it with you! 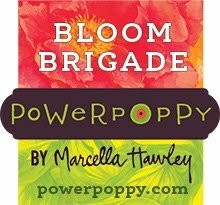 You can head on into the Power Poppy store and pick up all these beauties! Marcy’s got a special surprise for you shopping pleasure too! Both of your projects are beautiful! Your coloring on both cards is perfection. STUNNING design! Wow! Both cards are so beautiful and dramatic! Oh, my! Not one, but TWO incredible beauties! It's almost more than I can take! 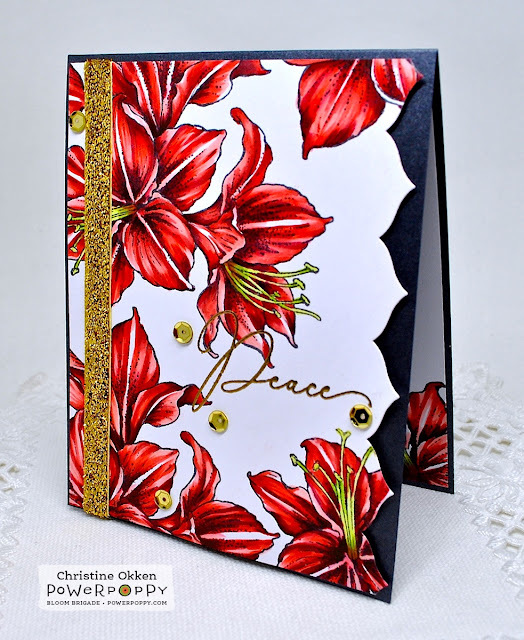 Love these flowers for Christmas cards. I placed my order for everything this morning. What a dilemma that you and the other designers have created for me. I need these stamps! Your illustrations have really interested me and I hope to order. It is a nice and quite solvable dilemma. I so enjoy your cards. What an awesome cards with an awesome stamp set! Great cards Christine, thank you so much for sharing. 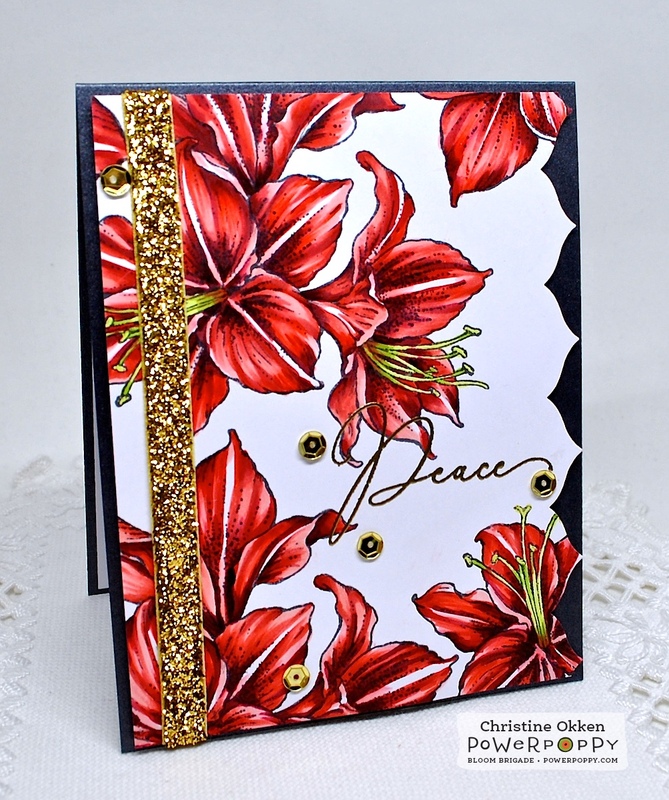 I love amaryllis and both of these are beautifully colored! Love. Both of these are gorgeous! I like the way you colored both of them and wonderful designs Christine.